Jean Paul Gaultier will launch Le Male Essence de Parfum and Classique Essence de Parfum, new flankers to to 1995’s Le Mâle and 1993's Classique respectively. Le Male Essence de Parfum ~ developed by perfumer Quentin Bisch, with citrus, cardamom, leather, lavender, woods and costus root. In 75 and 125 ml Eau de Parfum. Classique Essence de Parfum ~ developed by perfumer Daphné Bugey, with ginger, jasmine, orange blossom, woods, vanilla and chantilly cream. In 50 and 100 ml Eau de Parfum. 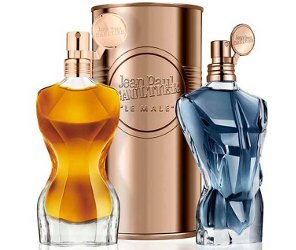 Jean Paul Gaultier Le Male Essence de Parfum and Classique Essence de Parfum debut later this month. I smelled the Classique Essence, it is nice and pleasant to wear. Those bottles are KILLING ME. Prices at Douglas are €82 for the women’s 50-mL and €72.95 for the men’s 75-mL. I haven’t liked most of the Gaultier flankers but I really want to try these. DYING! The “Le Male” Version seems like a very far different idea of the original… almost not even similar… I am going to have to try! The Master Kurkdjian is a hard act to follow! He is, but QB is a darned good perfumer too. I had to call some department store in Paris to order the Prestige presentation if Le Male. A bulb atomizer with a tassel! So strange and exotic for a mens scent. totally blind purchase but I had to have it! I did love it when it arrived. At the time I usually fell for heavy-lidded perfumes. Later, when it was launched in Sweden it soon became popular with young suburban boys spraying it on like it was a body spray. I could smell them litterally from blocks away. So that killed it for me and the fabulous Prestige bottle leaked and the alcohol evaporated. It’s still a good, albeit a bit too strong, fragrance and from the notes it seems like it could be a good update. It will be interesting to see how they create the Costus note. Real Costus is banned. It smells like dirty hair with a hint of violets.